In an innovative academic approach that combines the roles of dean of freshmen and director of the writing program, the College aims to spell success one student at a time. She could write a book about the freshman class, if she weren't so busy reading what Rochester's newest students write themselves. And she could tell you volumes about first-year students-their dreams, their worries-but she would rather spend her time listening to freshmen tell her about their goals for college and life after Rochester. And she would rather help them put some of that passion into writing. Meet Deborah Rossen-Knill: dean of freshmen and-in an innovative educational twist-director of the College writing program. A "double dean," so to speak, written with lowercase "d's," the better to emphasize her informal and engaging style. "Students will say to me, 'Here's who I am as a writer. Here's who I am as a person,'" Rossen-Knill says during a recent visit to the writing center's newly remodeled space in Rush Rhees. "'I'm a little overwhelmed by all the decisions I need to make. What can you do to help me?'" "Talking with students helps them navigate their way through writing and through the College," says Rossen-Knill, an accomplished writer herself. "I always encourage students who are contemplating a course of study to find their passion and match it to the academic discipline that incorporates that passion." Reasoning and Writing in the College: Meredith Wilf '05 (left) and Katie Wolak '05. As the person charged with the academic welfare of the first-year class, Rossen-Knill gets to know many of the 900 or so freshmen who arrive at the College each fall. For decades, first-year students at Rochester have been met by the dean of freshmen. As at most other top institutions, the University has long recognized that students making the transition from secondary school to college sometimes need a little extra attention. But beginning last fall, the position became more than a traditional deanship. Believed to be the only such combination among peer institutions, if not the country, the newly crafted position of freshman dean and director of the writing program offers unparalleled insights into the academic life, and ultimately, the future success of new students, says William Scott Green, dean of the College and the architect behind the move. One of the first signs that students are struggling academically or socially or culturally-and freshmen are particularly prone to struggles-is that their writing will suffer, Green says. "The combined positions more than double Deborah's effectiveness-the substantive educational role complements her advising role as dean of freshmen," says Green. "She gets to know the freshman class in a way that no other dean can know those students." And they get to know where she thinks writing fits into their academic programs. Which is to say, everywhere. For many, it's a challenging idea. "For most students, their previous context for writing was strictly English classes, and they consider writers to be a specific kind of student," says Rossen-Knill. "Writing and reading are central to the work of every researcher and scholar in every department." "A person may be an amazing mathematician-and I believe that math is a language of its own-however, for that language to have relevance beyond the discipline, you inevitably need writing." Fellowship: Fellows Katie Ekstrom '02 (left foreground) and Andy MacMillan '02 (right) talk with incoming fellows Jennifer Zogg '05, Ryan Accetta '05, and Lindsey Reilly '04 at a gathering last spring for fellows to meet one another. The future fellows were students in the course Advanced Writing and Peer Tutoring, taught by English department lecturer Brian O'Sullivan. Freshmen are notorious for burning the midnight oil. The writing fellows program-a network of peer advisors-was created to take advantage of that trait. In the program, undergraduate students from various academic backgrounds are available during the evening hours to help tutor freshmen struggling with a paper or an upcoming writing assignment. Just into its second semester, the program is already showing telltale signs of success. Based in an office in Lovejoy, the program offers both in-person tutoring and is expanding to offer a new online service, featuring a 24-hour turnaround time. Ittai Bushlin '03, writing fellow coordinator, has watched the program grow since its inception. "I think it is an amazing program," says Bushlin, "In our first semester we had more than 150 visits. This spring we have seven active fellows and next semester we anticipate having a total of 22. The goal is to spread the program all over the University." It's a view Rossen-Knill has developed through years of professional and personal writing. With a master of fine arts degree in fiction writing from the University of Michigan and a Ph.D. in English from the University of Minnesota, she has written in a range of styles from short stories to fundraising proposals to scholarly journal articles. Before joining the staff at Rochester, she was director of the "Writing Across the Curriculum" program and its recent counterpart "Speaking Across the Curriculum" at the University of Pennsylvania. When she learned about the plans for writing at Rochester, the entrepreneur in her took note. Here was a chance to build a new program. She also recognized the chance to guide students in the understanding that writing is, at its essence, the act of sharing knowledge. "Finding ways to communicate ideas to other people, not just to make people know you are right, but to clearly communicate from all perspectives, is the basis for academic discourse," says Rossen-Knill. "Establishing this level of discourse during the freshman year prepares students for a rewarding and challenging educational experience." Based on the cornerstone concept of the highly regarded Rochester Curriculum-that students learn best when they study subjects they are interested in-the writing program takes an interdisciplinary approach to the study of writing. As director, Rossen-Knill oversees the College's primary requirement, the course Reasoning and Writing in the College, an argument-based writing class that all first-year students must take. She also offers support to academic departments as they administer upper-level writing requirements. Throughout, Rossen-Knill emphasizes, the program focuses on arguments, analysis, research, and clear communication. That's accomplished in a framework that allows students to study writing in the context of subjects they love. "Of all the universities I've seen firsthand, the College's writing program is unique because students are empowered to make informed decisions based on their educational interests, and the program is coordinated across campus through shared principles," says Rossen-Knill. "But the program also provides autonomy so that instructors, coordinators, and peer leaders can directly shape writing experiences to fit the needs of their students. "Faculty from across the College have said they really want our students to conceptualize writing as integral to investigating, learning, and experiencing the world." In the freshman course, students explore writing by discussing and reading topics that range from history to music. Offered in both a standard class and an enhanced version for those who need more one-on-one support, class sizes are capped at 15 students to ensure that instructors get to know each student's writing and can offer individualized feedback. Christian Grose, a political science graduate student, teaches Writing about Political Science: Campaigns and Elections, a freshman writing class that uses political elections and campaign reform legislation to approach the writing process. In the highly informal, interactive class, students use readings to engage in debate, develop arguments, and communicate opinions with their peers through writing assignments, both personal and academic. That multisection approach appeals to students like Laura Braunstein '05, who considered herself a competent writer in high school and felt prepared to write at the college level. Expecting the basic freshman composition class, Braunstein was surprised when she read the class descriptions: films by John Waters, the science of the Cold War. These were not run-of-the-mill English lit classes. Braunstein signed up for From Political Punk to Corporate Pop: What is This Thing We Call Music?, a section taught by Drew Abrams, a graduate student from the Department of Physics and Astronomy. 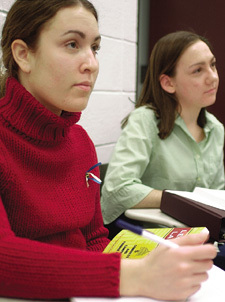 Tutoring: Anne Zanzucchi (left), a doctoral student in English, and Elena Tchourkina '04 discuss a writing assignment. Originally located in the basement of Morey Hall, the revitalized writing center has a new home on the ground floor of Rush Rhees Library. Students seem not only to know where the center is, but they are visiting in record numbers. From the fall 2000 to fall 2001, student visits increased by 36 percent, jumping from 430 to 670 visits a semester. And of the 670 visits last fall, more than 250 were first-timers. "We let the undergraduates know it's a place were they can come and brainstorm an essay, talk about writing problems, or ask specific questions about a paper in progress," says coordinator Esther Lopez. "Regardless of the method, the consultants always emphasize the writing process and not the finished product. Our mission is to build better writers not just better papers." "The class took a totally different approach to writing than I was used to in high school, where writing was always centered around analysis of literature," says Braunstein. "We had freedom to write in different styles. It's been my favorite class so far." Beyond the initial writing requirement, students are required to take at least two upper-level classes, usually within their areas of study, that have significant writing components. Assignments can range from lab reports to research-based, argumentative essays. While some departments have designated certain classes as "writing intensive," Rossen-Knill says the goal for the program is to seamlessly integrate writing into the curriculum so that if students complete their program of study, they satisfy the College writing requirements. "The upper-level writing requirements are shaped and monitored by individual departments with support from the writing program," says Rossen-Knill. "A political scientist, for example, knows what it means to be a professional writing in that discipline. This gives departments the freedom to develop their own writing-intensive classes, and we simply assist in that process. "The bottom line is that students should finish their programs having encountered writing in a significant way." In addition to redesigning the writing curriculum, Rossen-Knill has strengthened the support network for undergraduate writers. A new writing fellows program offers peer-to-peer advising, and it will soon launch an online advising effort in collaboration with the writing center. And the revitalized writing center has become a place where students go to get feedback on essays or reflect with tutors on ways to approach upcoming assignments. "The writing program in the College has been tremendously effective in a short period of time and has garnered positive reactions from students," says Green. "Deborah has done a superb job and has put the College in the forefront. She has built a program that has earned widespread respect from both students and faculty." A moment in her office and the clues to how she's earning that respect are clear. A Chinese wall hanging beside the open door roughly translates to mean "hard work and persistence lead to happiness in life"-for her, words to live by. In the small space, just large enough for a table and chair, Rossen-Knill offers guidance and helps students shape big dreams. "My hope for rising sophomores is that they embrace the opportunities at Rochester to pursue intellectual interests and shape their College experience," she says. "I hope that by the end of the freshman year, students will come to value the collaborative nature of research and learning in the College and begin to see their own role as contributors to our community of learners." Jenny Leonard is editor of Currents, the University's faculty-staff newsletter.